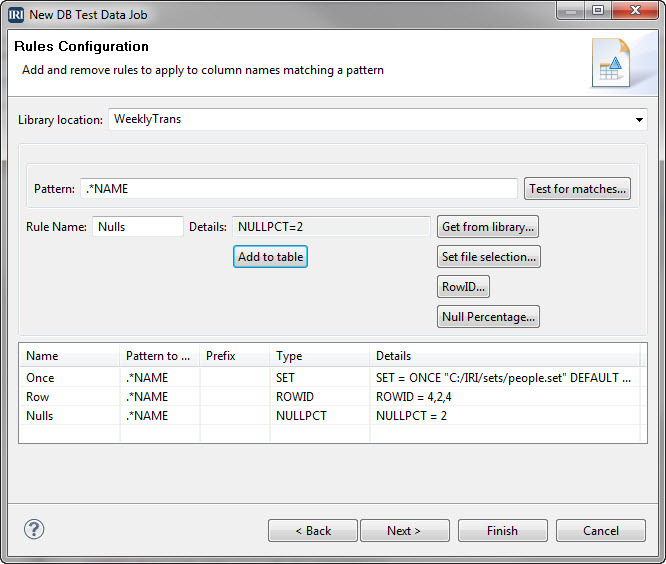 The 'New DB Test Data Job' wizard in the IRI RowGen GUI supports the specification and re-use of data generation rules for columns with pattern-matched names. When a defined name pattern is found, the rule you specify for those columns automatically applies at test data generation time. Target tables will be populated with the same kinds of test values in those columns. RowGen has many options for instilling data realism into both key and non-key columns. The rules you apply are your own, and many customization options exist. Cross-table rule application also preserves referential integrity among the test tables. Batch files and individual job scripts build when you finish the wizard. Execution of the batch script creates all of the required test data and, optionally, populates a supported target database.